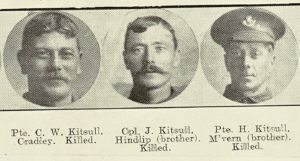 Charles Kitsull was born at Dudley in 1879. He married Mary Ann McCann in late 1900 at Dudley. By 1911 they had a family of four and were living at Ridgeway Cross, Cradley. 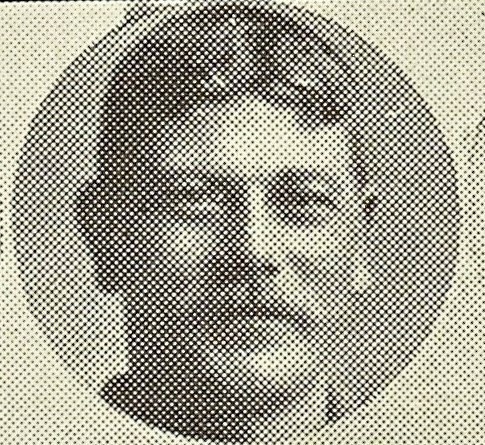 On the outbreak of war he enlisted in a Kitchener’s Army battalion of the Worcestershire Regiment at Worcester. He landed at Gallipoli with the 9th Battalion on 27th August 1915 and later moved with the unit to Mesopotamia. Here, in modern day Iraq, men of the 9th Worcestershire Battalion, a member of 13th Division, were involved in operations against Turkish forces holding Kut-al-Amara on the road to Baghdad. On the night of the 25th/25th January the 9th Worcesters and the 7th North Staffs were given orders to attack positions south of Kut along the Shatt-al-Hai, a branch of the river Tigris. The men lay down in front of the Turkish front line, waiting for the bombardment to lift, and then dashed forward with the bayonet. There was wild shooting and bayonetting along the trench, but in a few minutes all resistance was at an end. The men quickly consolidated the position. A trench mortar had been captured, but losses had been heavy, particularly in leaders – only four officers had reached the trench, including Captain E K Myles VC and 2/Lieutenant P S Beauchamp. On their left the men of the 7th North Staffords had also entered the front line, but were heavily counter-attacked, assisted by devastating fire from a trench-howitzer (at times four or five large bombs could be seen in the air at a time). Shattered by these bombs and attacks on every side the North Staffordshire men fell back, exposing the flank of the Worcestershire men. The line to the left was reinforced by the 9th Royal Warwickshire (led personally by their Colonel who was killed in the advance). For a while the Turkish counterattack died down. However at 3pm, a second counter attack developed, once more aided by the trench howitzer. The 9th Royal Warwicks were slowly driven back, and a similar attack wore down the resistance of the Worcestershire men. Of their four officers, now only two survived (Callender and Beauchamp having been killed). Despite immense bravery – Lieutenant Ainsworth for instance mounted a Lewis-gun on top of the parapet and fired it in in the open – the position was hopeless. At about 3.15pm ammunition ran out. The remnants of the 9th Royal Warwicks withdrew, taking a number of leaderless Worcestershire platoons with them. The remainder of the Battalion fell slowly back, under Captain Myles VC, occupied the British trench and prepared it for defence. It was not until after dark that Lieutenant Ainsworth came back, unscathed, carrying his Lewis-gun. Over 900 of the Brigade had fallen. The 9th Worcestershire Regiment had lost 12 officers and 327 NCOs and men killed or wounded (107 killed, 35 missing and 185 wounded according to the War Diary). Casualties that day included Charles Kitsull. 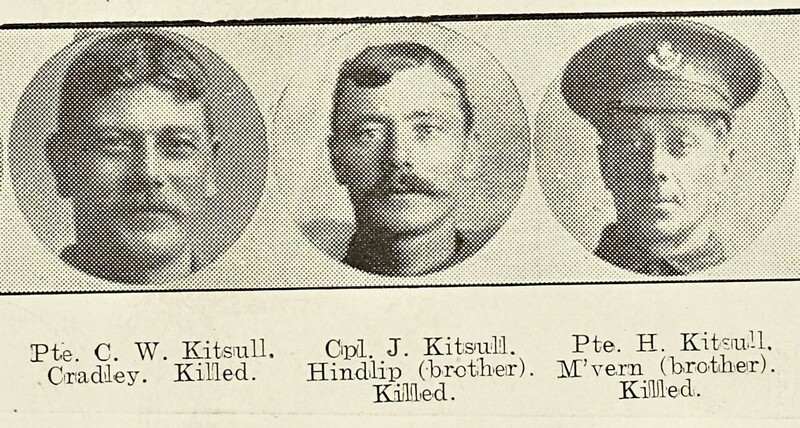 Charles had two brothers who were also killed in the war – George Henry Kitsull, commemorated at Holy Trinity Church, North Malvern and John Kitsull, of the 2nd Worcestershire Regiment who was killed in action on 5th November 1916 and is commemorated at St James Church, Hindlip.